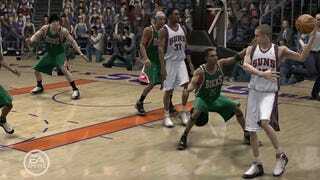 NBA Live 07 - a game now three years old - currently has about 500 players on Xbox Live. And they need 500 more in the next half-hour for every one of them to collect an easy 100 Gamerscore. Update: Doesn't sound like they made it. No word yet if they'll try again. The game included a 100-point achievement for being signed in at the same time as 1,000 other players. This achievement was not included in later versions. For many completionists, it's the last barrier to getting all 15 achievements and 1,000 score. So if you have NBA Live 07, log in now and stay online until 2 pm U.S. Mountain Time (40 minutes from now). You might pick up a stupid easy 100 points. You might also waste 40 minutes with a three-year old game, but hey, it's a Saturday. You had plans?